Is the long drive from the south the only issue holding you back from a holiday in the Dumfries and Galloway region of Scotland? There are many exiting and interesting travel options, should you really want to avoid the long drive from the South. Carlisle, Dumfries and Lockerbie are served by direct Anglo / Scottish train services. There are regular services operated by Virgin, First Scotrail from London Euston, Bristol, and the West Country calling at intermediate stations via, Birmingham, Leeds, Crewe. Prestwick International Airport is approx 1 hours drive from the cottage and takes regular service flights from the following....Ryanair Tel 0871 246 0000 operate to/from Bournemouth, Frankfurt, London Stansted, Dublin, Paris and Stockholm. British Midland Tel 0870 607 0555 operate to / from Cardiff. The roads are a pleasure to drive on, wide and well maintained with fantastic views. 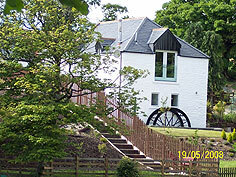 The mill is approximately 2.5 miles from the villages of Lochfoot, Crocketford and Haugh of Urr and 8 miles from Dumfries, Castle Douglas, and Dalbeattie. 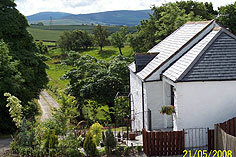 The cottage sits half a mile from the nearest public road, The Old Military Road, which runs parallel to the A75. Car and van rental is in-expensive, from as little as £24.00 per day and available from Avis and Hertz at their desks on the public concourse at Prestwick Airport and Carlisle Railway:AVIS +44 (0) 01228 590580 and HERTZ +44 (0) 01228 593 565. N.B. All All travel information listed is intended as a guide only and we recommend that you contact personally all of the companies you intend travelling or hiring with, through the word hyper links we have provided. "So there is no need to let the distance... spoil a once in a lifetime experience"